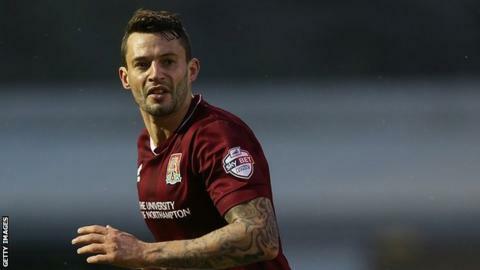 Northampton Town ended Accrington Stanley's seven-game unbeaten run in League Two with a narrow victory. Sean McConville hit the crossbar with Stanley's first chance, but the Cobblers responded with striker Marc Richards volleying wide. Accrington's Josh Windass fired off target and had a close-range effort saved before Richards headed in Ricky Holmes' cross to put Northampton ahead. Matt Crooks had a late chance for Stanley, but the home side held on. Match ends, Northampton Town 1, Accrington Stanley 0. Second Half ends, Northampton Town 1, Accrington Stanley 0. Corner, Accrington Stanley. Conceded by Brendon Moloney. Jason Mooney (Accrington Stanley) is shown the yellow card for a bad foul. Foul by Jason Mooney (Accrington Stanley). Attempt missed. Sean McConville (Accrington Stanley) right footed shot from outside the box is close, but misses to the right. Corner, Accrington Stanley. Conceded by Ryan Cresswell. Substitution, Accrington Stanley. Terry Gornell replaces Brad Halliday. Corner, Accrington Stanley. Conceded by Adam Smith. Attempt saved. Matt Crooks (Accrington Stanley) right footed shot from the centre of the box is saved in the bottom left corner. Attempt missed. Josh Windass (Accrington Stanley) right footed shot from the centre of the box is just a bit too high. Attempt missed. Tom Davies (Accrington Stanley) header from very close range is close, but misses to the right following a corner. Corner, Accrington Stanley. Conceded by Joel Byrom. Corner, Northampton Town. Conceded by Joe Wright. Attempt blocked. Marc Richards (Northampton Town) right footed shot from the centre of the box is blocked. Attempt missed. Marc Richards (Northampton Town) right footed shot from outside the box is just a bit too high. Goal! Northampton Town 1, Accrington Stanley 0. Marc Richards (Northampton Town) header from the centre of the box to the top left corner. Assisted by Ricky Holmes with a cross. Attempt missed. Tom Davies (Accrington Stanley) right footed shot from the left side of the six yard box is close, but misses to the left. Attempt saved. Josh Windass (Accrington Stanley) right footed shot from very close range is saved in the bottom right corner. Attempt blocked. Josh Windass (Accrington Stanley) right footed shot from the centre of the box is blocked.